In case you’ve been living under a rock, sales of Apple’s new iPad — known popularly as the ‘iPad 3’ — begin today across 10 countries worldwide, with Australia, Japan and Singapore the first three markets to begin selling the new tablet. Reviews of the device were universally positive however, with many pundits suggesting that the new retina display and support for 4G LTE mobile broadband don’t necessarily warrant an upgrade from the iPad 2, events so far have been less chaotic than other Apple launches. Operators opened the proceedings in Australia and Singapore as they began selling the device in the early hours, before the Apple Store had opened and launched itself. Australia become the first country to sell the new iPad as operator Telstra opened its doors in Sydney and Melbourne just after midnight to begin sales some eight hours before Apple, according to Reuters. However, while reports suggest that just “dozens” queued up for early access with Telstra, demand at Apple Stores was greater, with the line of customers in Sydney having reportedly “snaked around a city block”. 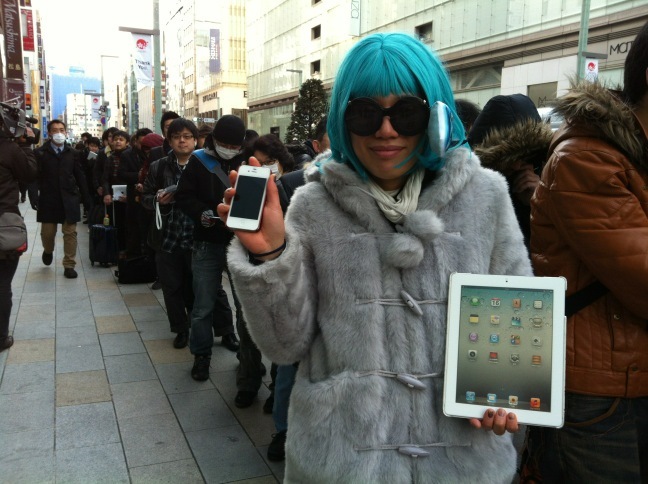 Japan is selling the iPad through the Apple Store and the Softbank store which appear to be serving up greater demand. Indeed, such was the anticipation that a number of die-hard Apple fans began waiting in line late Wednesday evening, some 36 hours before launch. This morning, the queues outside the Apple Store in Ginza, Tokyo, were estimated at 400 people, according to CNN correspondent Kyung Lah. Unlike Australia, it seems that Japan buyers had to wait until the 8:00 am opening time, with the Apple Store the only place selling the device. 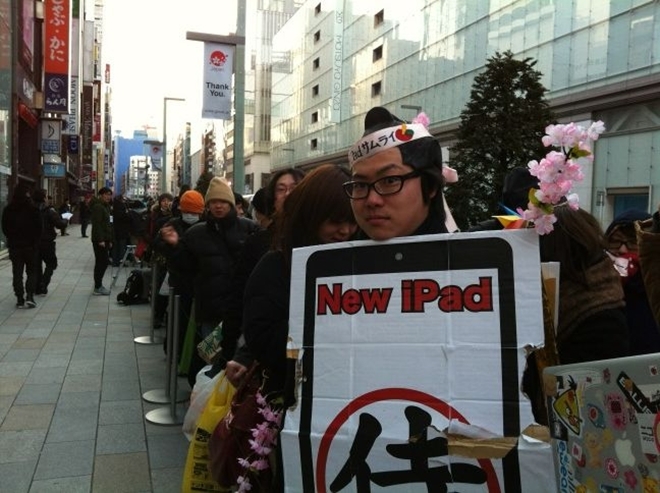 Update: A video from Steve Nagata, who is ironically the guy pictured above clasping his new iPad, shows that the queue at the Ginza Apple store picked up as the day went on. 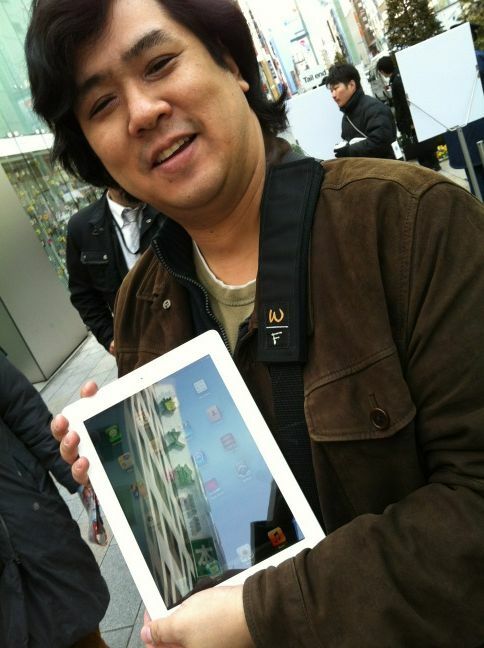 Singapore was, on paper, the third market to get the device but M1 beat Japan to selling the new iPad. 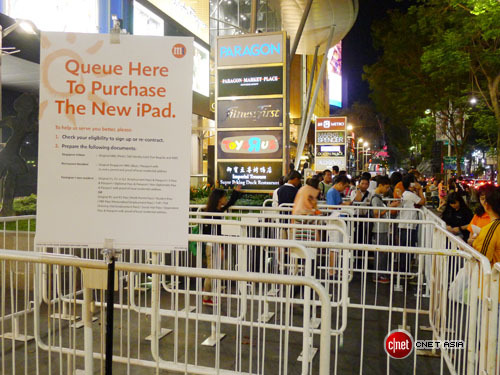 The operator held a midnight launch event at its store in the Orchard Road shopping district, as CNET Asia reports. Some customers were reported to have queued for as long as 12 hours to get the device, which also went on sale at the country’s Apple Store at 8:00 am. 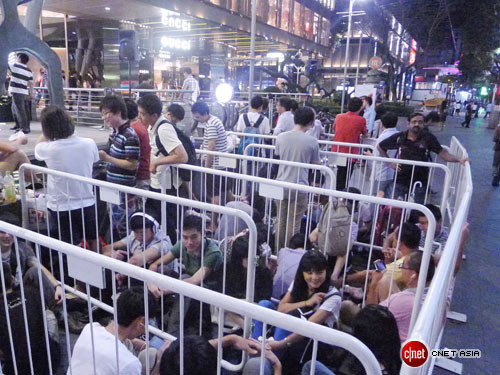 The launch in Singapore — which once had the world’s highest ratio of iOS devices to people — was the most hectic, as M1 used the same midnight opening strategy that had served it well for its iPhone 4S launch. In the build-up to the launch of the new iPad, Apple’s share price briefly hit the $600 mark for the first time in the company’s history, as investors showed confidence that the Cupertino-based company can sustain its incredible growth. Apple has launched a ‘Great New Apps’ section of its online store which is stocked with apps that take advantage of the device’s new retina display, which is the major new update and a primary selling point of the device. 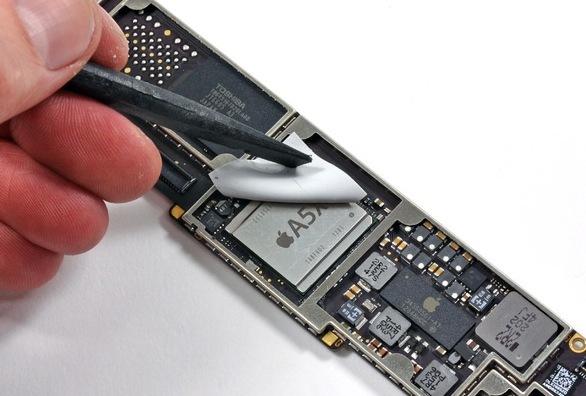 A product ‘teardown’ yesterday revealed details of the components inside the third-generation Apple tablet. Samsung is the manufacturer of the retina display, while the iPad was shown to have 1GB of RAM, as speculated, and a series of upgraded chips. Analyst firm Canaccord Genuity told Reuters that it believes Apple could sell 65 million iPads; that’s a figure that exceeds the total sales of 55 million for its first- and second-generation tablet devices to date. With telcos taking the lead on sales, which is also the case in the US where retailers will stock the tablet, Apple is opening more options than ever before to help its iPad series go mainstream. From March 23, the device will become available in addition markets: Austria, Belgium, Bulgaria, Czech Republic, Denmark, Finland, Greece, Hungary, Iceland, Ireland, Italy, Liechtenstein, Luxembourg, Macau, Mexico, The Netherlands, New Zealand, Norway, Poland, Portugal, Romania, Slovakia, Slovenia, Spain and Sweden.